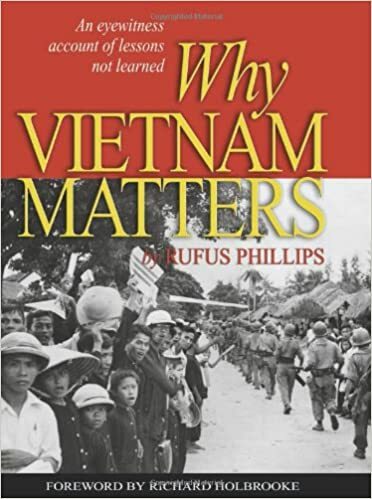 That’s the first line of one of the most important books on the early history of the Vietnam War, Why Vietnam Matters: An Eyewitness Account of Lessons Not Learned by Rufus Phillips. This 2008 memoir—now out in paperback for the first time (Naval Institute, 448 pp., $24.95—is an insider’s account of the fateful 1950s and early 1960s decisions that set in motion the U.S. war in Vietnam. Phillips, who turned 88 last month, was sent to South Vietnam in 1954 as a member of the first CIA team there, led by the legendary intelligence agent Edward Lansdale, a career USAF officer who worked with the OSS in World War II and the CIA after the war. Phillips spent most of the next decade doing undercover and pacification work in Vietnam. He played an important behind-the-scenes advisory role in the high-level power struggle that developed over how the United States would help South Vietnam defeat the communist Viet Cong and North Vietnamese. Rufus Phillips (who is a featured commentator in the new Ken Burns PBS Vietnam War documentary) was a strong proponent of what came to be known as the “hearts and minds” approach: helping build a stable democratic government in the south, one that the people of South Vietnam would put their lives on the line to preserve. At the same time, he (like his mentor, Lansdale) spoke out strongly and consistently against sending in American combat troops. That includes speaking face-to-face with President John F. Kennedy in the White House on September 10, 1963–a memorable meeting that Phillips describes in detail in the book. As we wrote in our 2008 review, this is a revealing inside-baseball memoir, in which Phillips provides a fascinating look at how the Kennedy and Johnson administrations never gave the pacification approach more than lip service. Phillips offers intimate, revealing portraits of the Lansdale, the colorful CIA operative Lucien Conein, South Vietnamese Premier Ngo Dinh Diem, Ambassador Henry Cabot Lodge, President JKennedy, Defense Secretary Robert S. McNamara, Secretary of State Dean Rusk, and a slew of other Kennedy and Johnson higher-ups. Phillips clearly shows that those best and brightest, especially McNamara, exhibited “poor judgment, bureaucratic prejudice, and personal hubris” as they steered Vietnam War policy in a disastrous course. Phillips adds a short chapter on lessons learned from the Vietnam War calamity. As I wrote in 2008, this book should be mandatory reading in Washington, D.C. It still should.